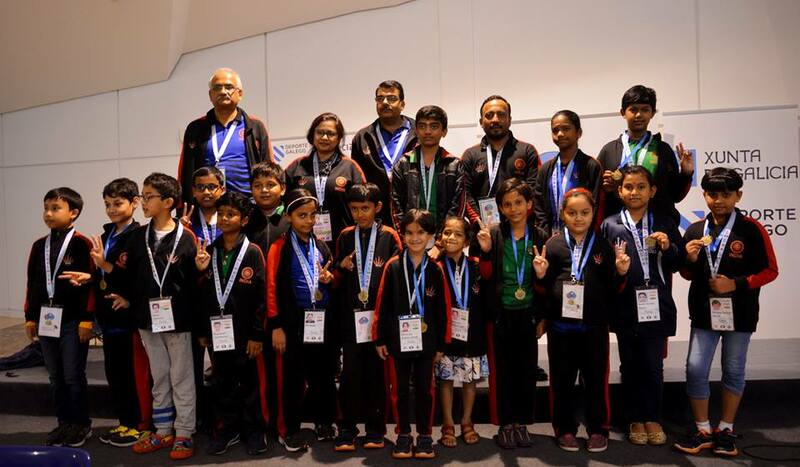 India won 2 Gold Medals in the U-12 Open (IM Gukesh D.) and Girls category (Savitha Shri). 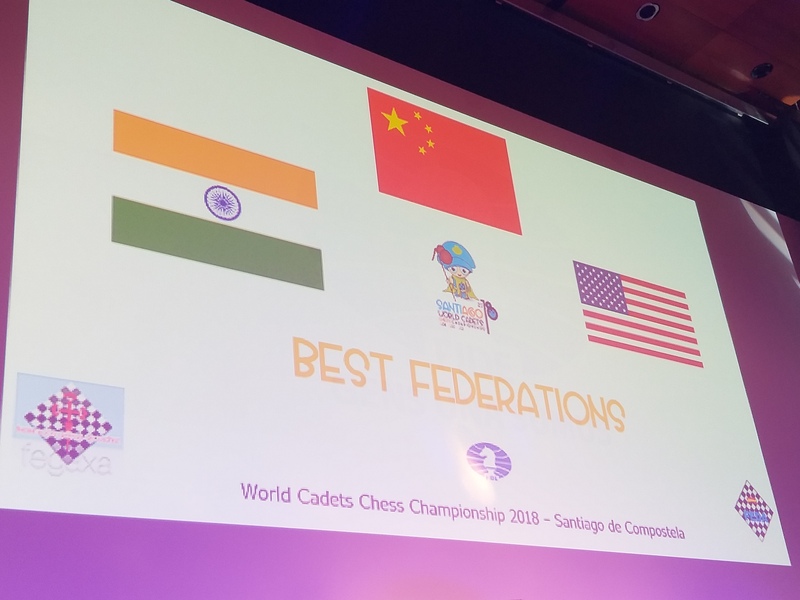 India stood 2nd with 2 Gold Medals for best performance among Federations while China with 2 Golds and a Bronze and USA with 1 Gold 1 Silver and 2 Bronze medals took the 1st and 3rd place respectively. IM Gukesh with 10 wins and a loss comfortably won the U-12 Open World Cadet Championship by a huge margin of 1.5 points. Playing White against Razafindratsima Timothe of France he opted for the Double fianchetto variation and ruthlessly attacked on the K-side and mated his opponent in 54 moves. The 2nd and 3rd places were won by Murzin Volodor of Russia and Chasin Nico of USA with 8.5 points. 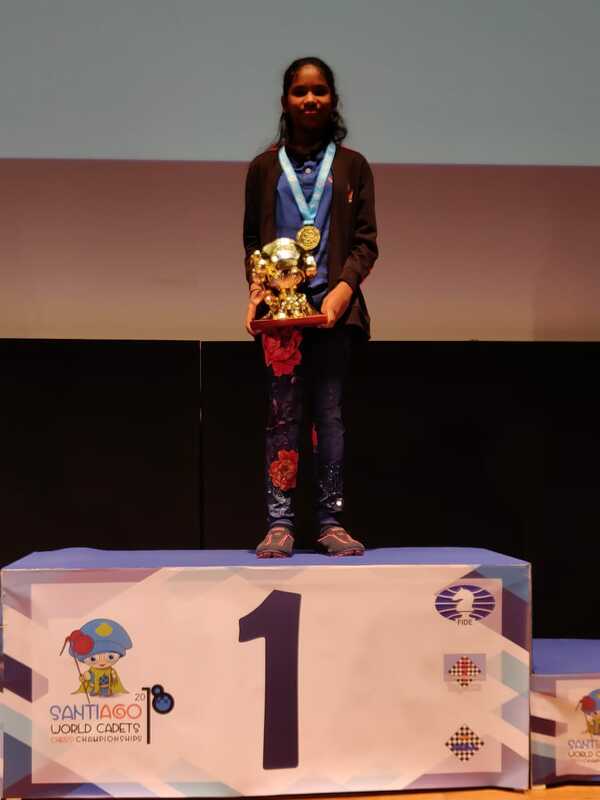 Savitha Shri B effortlessly won the U-12 Girls World Cadet Championship with an unbeaten score of 8 wins and 2 draws. Facing the Chigorin defence she comfortably drew her final round in 38 moves against the Russian Zavivaeve Emilia who finished 3rd. The 2nd place went to Omonova Umida of Uzbekistan. Indian players Tanisha B S and Mahi Amit Doshi finished with 7.5 and 7 points respectively. In the U-10 Open 1st and 2nd place went to Jin Yueheng of China and Zhao Erick of USA with 9 points each while the 3rd place went to Volkov Maxim of Russia who scored 8.5 points. Indian players Kadam Om Manish scored 7 points while Vishwaksen and Johk V A finished with 5.5 points and 5 points respectively. 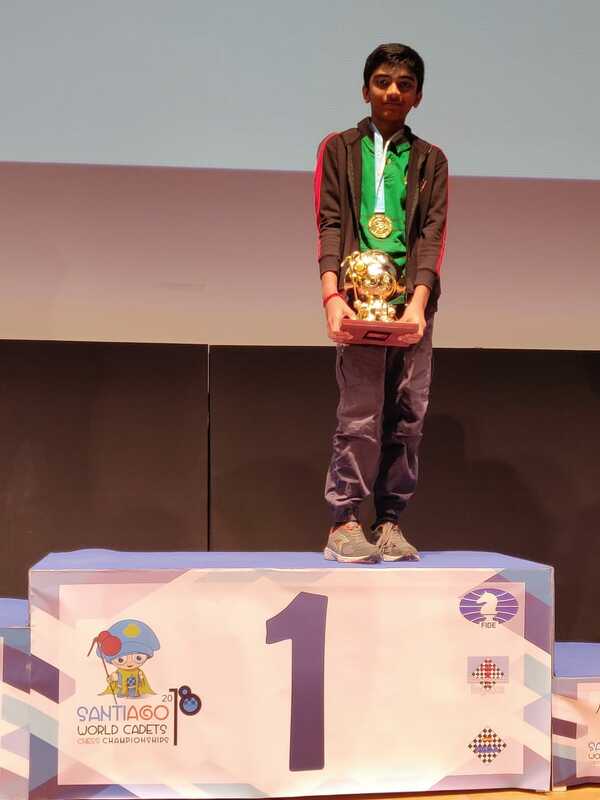 In the U-10 Girls, 1st place was grabbed by Edithso Samantha of Indonesia with 9 points while 2nd and 3rd place were taken by Shvedova Alexandra of Russia and Chen Yining of China with 8.5 points. Indian players Anupam M S finished with 7 points while Shnefali A N and Rajanya D scored 6 points each. In the U-8 Open 1st place went to Chennareddy Yuvraj of USA with a clean score of 10.5 points. The 2nd place was taken by Azadaliyev Jahandar of Azerbaijan with 9 points and Begmuratov Khumoyun of Uzbekistan took the 3rd place with 8.5 points. 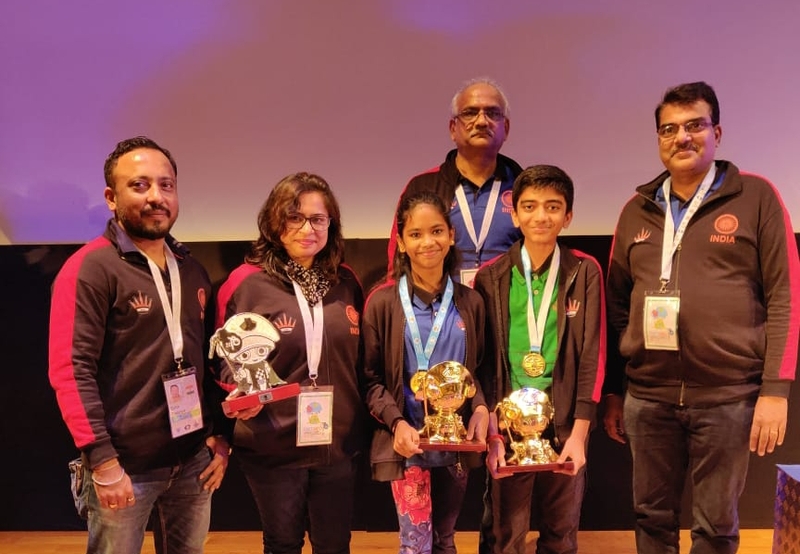 Indian players Lakshyesh M G scored 7.5 points while Kiaan Agrawal and Mrinmoy Rajkhowa scored 6 points each.Ishaan S K and Shashindra Kumar finished with 5.5 and 5 points respectively. In the U-8 Girls 1st place went to Zhao Yunquing of China with 9.5 points and 2nd place went to Iudina Veronika of Russia with 9 points while 3rd place went to Qiao Evelyn of USA with 8.5 points. 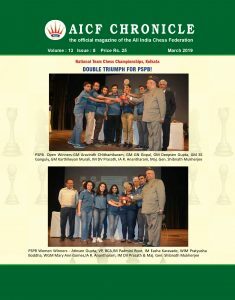 Indian players Arshiya Das and Shreya G H finished with 7 points each, Shriyana Mallya and Swarali H finished with 6 points each while Harini Sri A and Tanishka J finished with 5.5 and 4.5 points respectively.